Before the trip, Marc and I debated whether to do the 4 day classic Inca Trail trek, 2 day trip with 1 day trek, or just take the train directly up there. We heard a lot of mixed reviews about the 4 day trek- people who thought the trail was repetitive and not as rewarding as the actual Machu Picchu site and those who absolutely loved the experience. The train ride directly to Machu Picchu didn’t sound like much of an adventure. We didn’t absolutely feel the need to trek for 4 days and we didn’t have that much time anyway, so we chose the 2 day Inca Trail. Best hike ever! I think because we did the 6 mile trek up and down their crazy mountains (plus the Sacred Valley hike to the Pisac Ruins the day before), we were truly able to appreciate the Inca trails and how protected and hidden Machu Picchu had been. When we finally reached the Sun Gate after 6 hours of hiking and saw the sun beaming down on the the Inca city in the distance, I could almost hear music playing (like in the movies when they discover Atlantis!). It was amazing! In order to hike the Inca trail, you need a guide (probably because there are so many trails and they don’t want to risk people getting lost and accidentally destroying precious Inca history). We chose Llama Path, recommended by a friend who did it last year. The first day included a 10 mile hike along the Inca trail to Machu Picchu (optional bus ride when you reach 10 km) and the second day they gave us a 2 hour tour and 2 hour self-exploration of Machu Picchu (mostly for people to go up to Huayna Picchu if they opted for it). First day: our guide, Adolfo, picked us up at our hotel at 5am and we were driven to Ollantaytambo. We had breakfast there, bought some toilet paper and ponchos for the trek, and boarded a train. We took Peru Rail which is a private, touristy train that cost $60 each way (I think? It’s included in our package). It’s a very slow 1 hour and 40 minute ride with windows above and all along the car so you can enjoy the scenery. It’s a nice ride. You pass the starting point of the 4 day trek and the first Inca site of their trek. At the 104 km mark (aka in the middle of no where), the train stops and you literally hop off the train. We were the only ones in our train car to do this, everyone else was going straight to Aguas Calientes to take the bus up to Machu Picchu. It was kind of exciting jumping off the train, like cowboys in an old western movie except the train was stopped and I had a bad ankle (which I ended up landing on of course). Within the first 20 minutes, we arrived at one of many Inca ruins. It was a nice little introduction. After that, the rest of the first 4 miles was pretty much all uphill in dry and hot conditions. I kept thinking how people used to and still do this regularly, and how the hell Incas navigated these mountains in search of the perfect land for their towns, and how they established these trails! Apparently the Incas used to have messengers who would run these trails regularly to pass messages within hours. 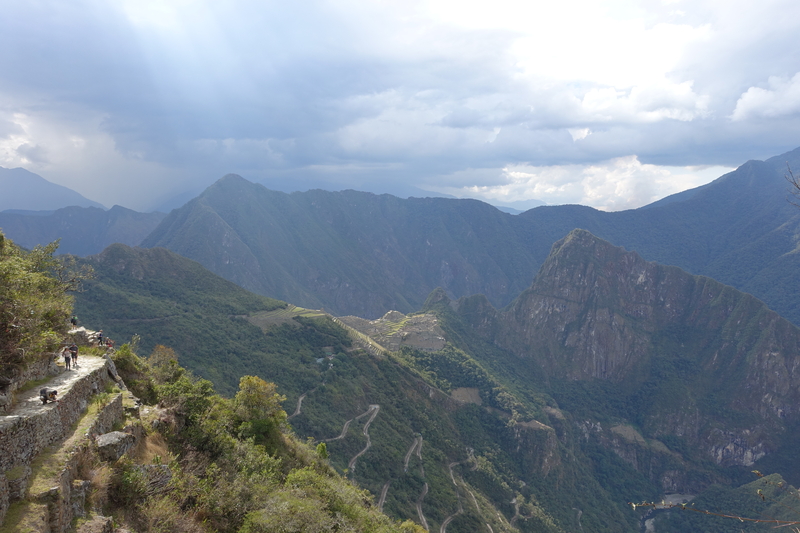 Also, just a few years ago, there was an Inca trail race and a porter finished the entire 4 day 45km trek in 3.5 hours! ..And here I was, struggling with my 1 day trek. Incredible. After another hour or two, we made it to the Sun Gate! Absolutely amazing. It’s really impressive they hid an entire city for 500-800 people between these massive mountains from the Spaniards and it took ~500 years before it was uncovered (to be more exact, locals knew about it but it took ~500 years for the world to learn about it). My ankle was so swollen by the time we reached Machu Picchu, I thought it best we take the 30 minute bus down to Aguas Calientes. Aguas Calientes exists basically for Machu Picchu tourism. There’s not much to it but markets of souvenirs and expensive restaurants. They do have hot springs though but I haven’t heard great things about them so we didn’t do that. The next day, we went back up to Machu Picchu by bus. It was raining when we got on the bus but by the time we reached Machu Picchu, it had stopped and the clouds were rolling in and out over the mountains. It really gives it that “mystical” appearance. We learned all about the history of Machu Picchu, how the city was divided up (ie commercial, residential, industrial areas), how their temples were built differently than the buildings for man, how they studied astronomy (water mirrors! ), how they determined solstice, how they carved rocks to build their city, etc. It is really astonishing how developed the Inca empire was. I still can’t believe the Spaniards killed them and didn’t bother to learn from them. Greedy bastards. Temple of the Sun Perfect stonework. The windows were perfectly placed so the light could come in a certain way for their religious ceremonies on solstice. Example of flat, perfect stone work on left for the temple and ordinary stone on right. The Main Temple – all their temples are built perfectly which is why many believe the right side was intentionally built that way. Water Mirror used to observe the sky. Astronomy! Intihuantana located at the top of the sacred mountain. A kind of clock to measure when was the time to celebrate the winter solstice, called by the Incas INTI Raymi, one of the most important celebrations and rituals of the entire Empire. This time on the drive from Ollantaytambo to Cusco, I stayed wide awake. The views were gorgeous! Couldn’t believe I slept through it the first time around. Here are some random shots from the drive. Machu Picchu is beautiful in pictures but actually experiencing it gives you a greater appreciation for it. It is definitely one of the coolest things I have ever seen!